World X 1 and 2 from Northstar are CD-ROMs for the Digidesign SampleCell I & II which incorporate a total of 96 banks of digital instrumentation. And with it, you can have the world. That's right, sounds from all over the world. 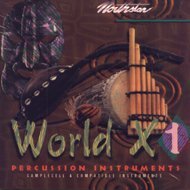 World X 1 focuses on pitched ethnic and world instruments . Zhengs, banjos, bagpipes, kotos and pan pipes. Vol. 2 gets you all the percussion instruments from Africa, South America, the Middle East and India. All acoustically generated sounds. No electronics! And at $199 each, that's less than $5 per bank! Northstar is known for detail and they've left nothing out! Each bank meticulously sampled with many instruments at multiple velocity levels; all the sampled nuances to capture the real instrument. Northstar includes many sampled performances of an instrument as well, all to bring the real power of SampleCell to life!